"Unstable? I'm stable! Who wants to watch me on television?" Daytime drama star Celeste Talbert (Sally Field) plays the long-suffering heroine "Maggie" on the long-running series "The Sun Also Sets." Her producer, David Seton Barnes (Robert Downey, Jr.), conspires with supporting star Montana Moorehead (Cathy Moriarty) to remove "Maggie" from the show, but their calculated reintroduction of Celeste's one-time lover Jeffery Anderson (Kevin Kline) as "Dr. Rod Randall" backfires. As rivalries erupt and tempers flare, Celeste's niece, Lori Craven (Elisabeth Shue), joins the cast, head writer Rose Schwartz (Whoopi Goldberg) tries to contain the insanity, and network executive Edmund Edwards (Garry Marshall) revels in the free publicity generated by all the backstage drama. Screenwriter Robert Harling is probably best known for his successful play Steel Magnolias, and Soapdish has all the artificiality but little of the warmth of his previous effort. The basic joke here is that the people responsible for putting an hour's worth of daytime drama on the air every weekday are actually leading soap-worthy lives themselves—buried pasts, shocking revelations and melodramatic emotional scenes abound. But the film's talented cast (which also includes Carrie Fisher and Teri Hatcher) isn't given much to work with—none of the characters are very sympathetic, and while the script's abundant, catty one-liners are often funny, they don't enliven or illuminate the story to any great degree. Kline mugs, Field panics, Downey fumbles, and Golberg smirks, but everyone seems to be going through the motions, and we never believe it for a minute. It's not all bad—director Michael Hoffman maintains a practical sense of show business that enhances the script's best moments. Anderson's nightmarish stint on the has-been circuit, playing Willy Loman to a crowd of inattentive senior citizens in a Florida dinner theatre, is very funny and oddly poignant, as is Celeste's crowd-pleasing foray into a public mall to assuage her insecurity. And the behind-the-scenes soap opera production milieu seems exaggerated but basically credible—details of costuming, casting and business decisions ring true. The show-within-a-show excerpts of "The Sun Also Sets" are well-executed parodies of the soap opera format, with a sly wit that neatly avoids the usual "John! Marsha!" approach. This is no mean feat—most attempts at soap opera parody are approached with a sledgehammer, and Soapdish manages a subtly satirical take, written with a true understanding of the genre's conventions and limitations. There are also some nice visuals, with mirrors, TV monitors and crane shots used to good effect in illustrating the film's central reality-versus-television conceit. But in the end, the talented performers, creative cinematography and convincing atmosphere aren't enough to make Soapdish a satisfying experience. It's a well-produced but empty-headed affair; a cartoonish romp that has its moments and plentiful plot twists and turns, but doesn't add up to much. Fans of the cast or the soap opera genre may want to check this one out, but there are better ways to spend ninety minutes. Image Transfer Review: Soapdish is presented in its original 1.85:1 widescreen theatrical aspect ratio, with a solid anamorphic transfer drawn from a fairly clean source print. The single-layer digital presentation handles the film's subtle grain fairly well, though I did spot one instance of compression "blurring" noise, and it's a solid image overall, with good color and minimal edge enhancement. Audio Transfer Review: Soapdish sounds surprisingly good for its age and nature, with a re-engineered Dolby Digital 5.1 soundtrack as well as original English Dolby 2.0 Surround and French stereo tracks. Dialogue is crisp, Alan Silvestri's jazzy mambo score is nicely rendered with solid highs and a bit of active bass, and the mix created at Skywalker Sound is clean and well-balanced. The surrounds are fairly quiet, providing subtle ambience only, but the 5.1 discrete mix features enhanced frequency and dynamic range as compared to the flat-sounding original 2.0 track. The French stereo track benefits from good performances and appropriate voice casting—as there are no French subtitles provided, some viewers will appreciate the high-quality dubbing. A solid audio presentation all around. Extras Review: Soapdish comes to DVD with 15 picture-menu chapter stops, optional English subtitles, and minimal extras. The film's two-and-a-half-minute Theatrical Trailer, drawn from a fairly grainy source print, is nicely presented in 1.85:1 anamorphic format with monaural audio; it plays up the cast and some of the best lines in the usual fashion. A Behind-the-Scenes Featurette runs four-and-a-half minutes, but it's a typical "electronic press kit" television promo that provides no substantial information about the film. 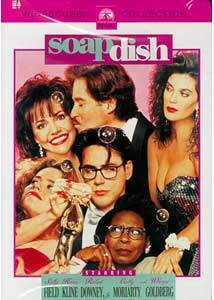 Soapdish contains some funny moments and clever, catty lines, but it ultimately squanders an all-star cast of talented comic actors on a contrived, insubstantial script. Paramount's DVD features a solid transfer, and soap opera devotees may find something to chuckle at here. Approach with caution.